McCormack was nominated alongside writers like Eimear McBride, Han Kang and Elizabeth Strout. IRISH WRITER MIKE McCormack has been named the winner of this year’s prestigious €100k 2018 Dublin International Literary Award for his stunning novel Solar Bones. The incredible prize saw McCormack nominated alongside a wealth of talented writers, including Elizabeth Strout, Eimear McBride, and Han Kang. The book award – previously called the Impac – has been running for 23 years and is sponsored by Dublin City Council. It’s managed by Dublin City Libraries. “Having Solar Bones chosen from such a wealth of world literature is a wonderful honour,” Mike McCormack said. Speaking to TheJournal.ie, McCormack said that he was so taken aback at the news of his win that he was rendered speechless. His novel, about an engineer named Marcus Conway who reflects on his life after his death, has won numerous awards and been much lauded by book fans in Ireland and beyond. Its success is made even more sweet by the fact that it went through the hands of numerous publishers before Ireland’s Tramp Press jumped at the chance to publish it. “It’s about your book falling into the right hands at the right moment,” he said of Solar Bones’ success. Fellow novelist Tim Parkes once told him “it’s not about getting a big publisher or this publisher or that, but it’s about the book falling into the right people’s hands at the right time”. The book had gone through many publishers’ hands before Tramp Press took it on. Sarah Davis-Goff and Lisa Coen of Tramp Press spoke of their delight at McCormack’s win. 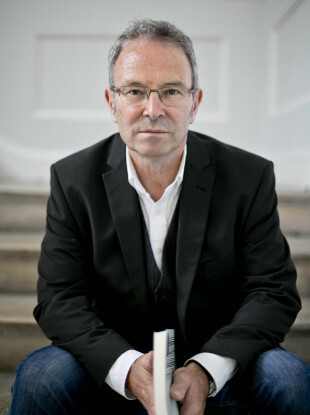 “We are thrilled to see Mike McCormack’s extraordinary novel receive this important award. Solar Bones is an incredible book, and Mike is a great writer, teacher, and GAA fanatic, so it is fitting he should be celebrated with an award chosen by readers,” said Lisa Coen. “Mike McCormack is one of the world’s greatest living writers, and Solar Bones is a masterpiece. This recognition for his work is so wonderful and we could not be more delighted for him,” added Sarah Davis-Goff. The ‘one-sentence’ book has also won the Goldsmiths Prize, the Novel of the Year Award and Book of the Year awards at the Bord Gáis Energy Irish Book Awards, and was long-listed for the Man Booker Prize. Tramp Press is the first Irish publisher to win the award, while McCormack’s agent, Marianne Gunn O’Connor, has become the first Irish agent to work with a winner. McCormack’s previous work includes Notes from a Coma (2005), which was shortlisted for the Irish Book of the Year Award, and Forensic Songs (2012). In 1996 he was awarded the Rooney Prize for Irish Literature and in 2007 he was awarded a Civitella Ranieri Fellowship. In 2018 he was elected to the Aosdána. Read a full interview with McCormack this weekend on TheJournal.ie. Email “Mike McCormack's 'brave, challenging' book Solar Bones wins €100k Dublin Literary Award”. Feedback on “Mike McCormack's 'brave, challenging' book Solar Bones wins €100k Dublin Literary Award”.